National Assembly Speaker Jacob Mudenda (file photo). The government does not have information on the number of companies that have closed in the past two decades, Speaker of Parliament Jacob Mudenda has said. Zimbabwe has long struggled with a serious economic crisis that decimated industry resulting in unemployment being estimated at more than 80 percent. However, addressing the CEO Africa Roundtable in Harare last Friday Mudenda said the government does not have exact figures on the number of companies which were forced to close down. "As our economic diplomats, you must have comprehensive data on all companies which have closed down in the last two decades because, as of now, the government does not know how many companies have shut down and reasons behind," Mudenda told members of the CEO Africa Roundtable last Friday. "Did these companies close down because of inadequate foreign currency and how much of it is required by each of such companies?" "Or some of these companies closed down because they need retooling and applicable technologies, it is my humble submission that the private sector is wanting in this regard. "A doctor can only apply appropriate medication when the cause of ailment has been fully diagnosed." 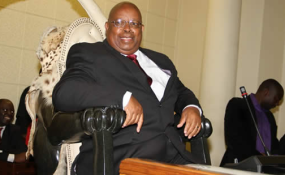 Mudenda also challenged the CEOs to be well versed on the various areas of investment such as mining, agriculture, tourism and infrastructure development so that they could be effective economic diplomats for the country. "It is therefore supremely critical for CEO Africa Roundtable working with Confederation of Zimbabwe Industries and Zimbabwe National Chamber of Commerce to come up with updated statistical investment data for ease of reference by our potential investors who are going to be wooed through your economic diplomacy," he said. "Above all else, we can resolve our economic challenges if and when both private and public sector demonstrate innovative and creative leadership that is premised on sustainable political will. He added, "The blame game mantle is short-sighted as it succumbs to myopic assessment of challenges. "We have to display salutary leadership which acknowledges challenges as opportunities for innovative and creative thinking towards finding solutions to problems confronting our economy."